The first time you visit Paris, or any new destination, the question asked isn’t usually what attractions should be scene but what attraction to see first, what to expect, how to get there, and how much time is needed. We’ve provided tips, advice, and other information about the top tourist attractions in Paris to help with your itinerary planning. If you are visiting Paris, you have to tour the Eiffel Tower. 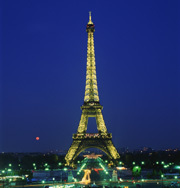 The Eiffel Tower is one of the most recognizable symbols ever built. However, there really isn’t much to tour or learn about. The Eiffel Tower was originally built in 1899 and was suppose to be a temporary symbol for the 1899 Exposition Universelle (World’s Fair). Somehow the Eiffel Tower managed to survive and grew to become the Paris Icon that it is today. The tower is painted brown and in the daytime it may be a bit of a disappointment. There are a number of restaurants and shops inside the Eiffel Tower. Tickets to the second floor and top floor can be purchased at the information office at the base of the tower. You can expect a long wait for the elevator and it gets a little confusing. However, the awe-inspiring view of Paris is well worth it. In the evening, Paris wouldn’t be Paris without the illuminated Eiffel Tower in the backdrop. You could spend weeks at the Louvre but still you wouldn’t have time to appreciate each masterpiece. The Louvre is the world’s largest museum and contains over 30,000 works of art. Surveying the Louvre can be exhausting but your journey through history is also very rewarding. Upon your arrival at the Louvre, you’ll first be amazed by the size of the fortress in which the museum is housed. The Louvre was first built in 1200 and later became the royal family’s palace in 1500. The palace was finally opened as a museum in 1793. More recently, the now familiar glass pyramids were added in the 1980’s and serve as the entrance to the museum. The Louvre is generally very crowded and can certainly be confusing. Your first stop should be the information desk on the ground floor. Once you have reviewed the tour schedule, you will most likely want to join one of the 90 minute guided tours. Roaming the Louvre with or without the free map can be very difficult. As part of the guided tour, you are provided with a headset so that you can hear the tour guide despite the fact that at times you may be 30 feet from the guide. The Louvre is divided into nine collections including the History of the Louvre and Medieval Louvre, Oriental Antiquities, Arts of Islam, Egyptian Antiquities, Sculptures, Objects d’art, Paintings, Prints, and Drawings, and Arts of Africa, Asia, Oceania and the Americas. Related, the Louvre is broken up into three wings: Richelieu, Sully, and Denon. Some of the more famous masterpieces include the Mona Lisa, the Venus de Milo, and the Winged Victory of Samothrace. You also will not want to miss the Coronation of Napoleon. The policy of the museum is to allow photographs. However, many sightseers may complain arguing that the flashes fade the paintings. Time flies by at the Louvre. You’ll leave happily fulfilled but also very tired. However, a day trip will only scratch the surface of what can be discovered at the Louvre. Notre-Dame is another one of Paris’ top symbols. The cathedrale is located on the tiny Ile de la Cite. Fittingly, the first settlement arose on the Ile de la Cite making it Paris’ birthplace. The area was chosen because the surrounding waters provided protection from invading armies. Cathedrale Notre-Dame was built in 1163 and finally completed in the 14th century. Its gothic style communicates biblical history to on-seeers. 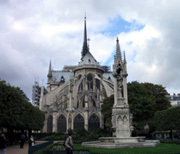 The Cathedrale Notre-Dame dominates the history of Paris. Napoleon crowned himself emperor here and General de Gaulle gave thanks here when the Germans freed Paris. Notre-Dame is another must see Paris attraction. However, the Cathedrale is undergoing a long-term restoration process and may be partially obstructed. The Basilique du Sacre-Coeur is located a top a large hill just beyond Montmarte’s main square. You’ll most likely have to push your way past some street hustlers. Hold on to your wallet. Don’t let them tie a string around your finger. Whatever they tell you, it is not a French custom. Once you get to the stairs, you’ll be fine. It’s quite a hike to the top so take your time and enjoy it. Once you get to the hilltop, you’ll gaze in awe at the spectacular view of Paris. During the daytime you can take a peak inside the church. However, Basilique du Sacre-Coeur’s main draw is its view of Paris. Spend the next couple of hours walking the streets around Montmartre’s Place du Tertre. This area doesn’t seem to have been disturbed by time and remains much how it was when Van Gogh lived here. Jim Morrison, the legendary pop icon and front man for the Doors died while living in Paris on July 3rd 1971. He was laid to rest in the Pere Lachaise Cemetery. Paris’ largest cemetery and final resting place of many famous artists, poets, and statesmen. There are diagrams of the cemetery at each of the many entrances. However, navigating through the Pere Lachaise can be confusing and frustration. The cemetery is quite remarkable. There are thousands of trees amongst thousands of elaborate tombs. Finding the grave of Jim Morrison is no small task so plan on spending at least a few hours strolling through the cemetery. Your best bet is to ask someone for directions. If you still can’t find Jim Morrison’s grave, ask someone else. The grave is one of the smaller ones although there are usually groups of people around the site. There is graffiti marked on surrounding graves and typically flowers along with candles or incense burning on top the grave. Many make the pilgrimage to Jim Morrison’s grave when visiting Paris. It has developed into a top Paris attraction.